Health care reforms aimed at improving quality have increasingly emphasized patientsâ€™ involvement in their own care. Despite the growing prominence of these patient-centered models of care, our understanding of how patients assess their own health care is limited (AP-NORC 2014; Quincy 2014, 2016). In this QuickTake, we use data from the September 2016 Health Reform Monitoring Survey (HRMS)1 to explore patientsâ€™ assessment of their health care by demographic, socioeconomic, and health characteristics. 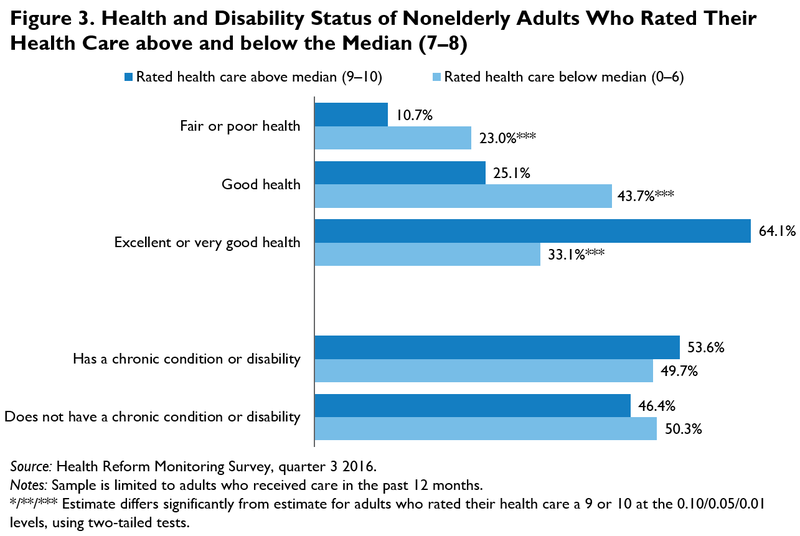 Survey respondents were asked to rate the health care they had received over the past 12 months on a scale of 0 to 10, where 0 represented the worst possible care and 10 represented the best possible care.2 Of a sample of 7,233 nonelderly adults who had received care in the past 12 months, 41.3 percent gave a rating of 7 or 8, the median response category; 26.9 percent of adults rated their health care below the median category (0 through 6), and 31.7 percent rated it above the median (9 or 10; data not shown).3 We compare the demographic, socioeconomic, and health characteristics of adults who rated their health care above and below the median response category of 7–8. 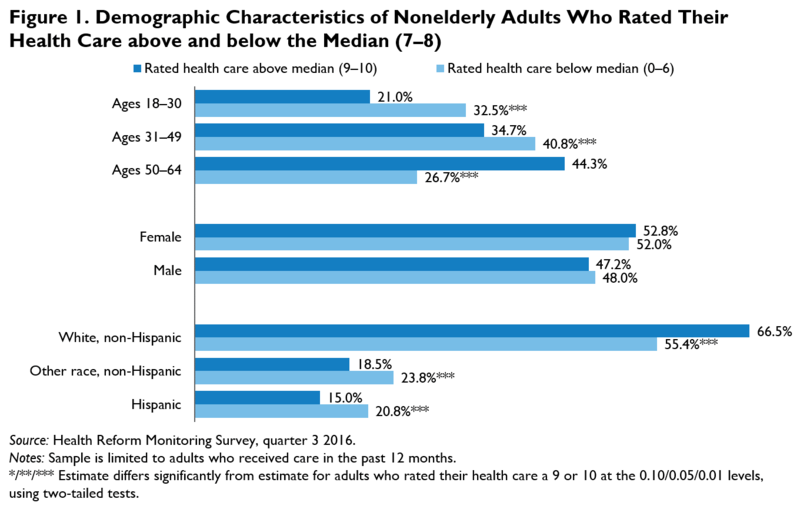 Adults who rated their health care below the median category of 7â€“8 were more likely to be younger and more likely to be Hispanic or nonwhite (figure 1). They also typically had fewer economic resources: they were more likely to have family incomes at or below 138 percent of the federal poverty level (FPL) and almost twice as likely to be unemployed (figure 2). Consistent with those findings, they were also less likely to have a college education. Adults who gave ratings below the median were more than twice as likely as those who gave ratings above the median to say their health was fair or poor (23.0 percent versus 10.7 percent), and less likely to say their health was very good or excellent (33.1 percent versus 64.1 percent; figure 3). However, there were no significant differences in the shares reporting a chronic condition or disability. 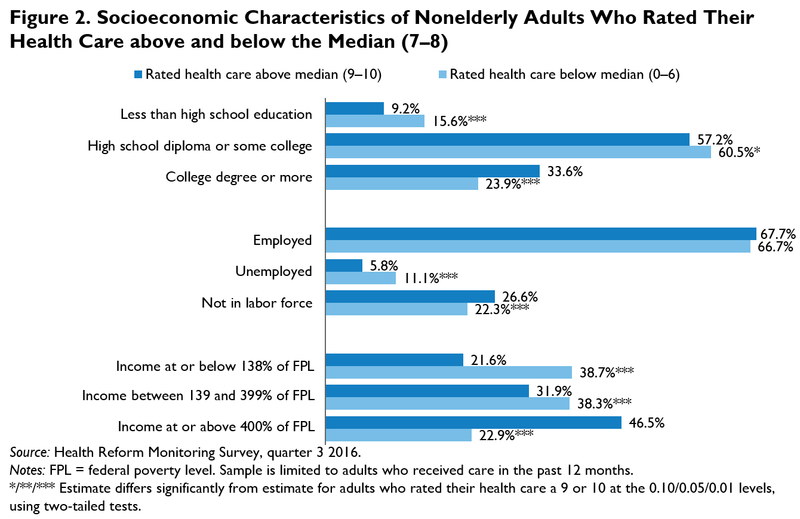 Though most adults gave relatively high ratings of their health care, many who gave ratings below the median—roughly one in four adults—were disadvantaged along many dimensions beyond the care they received. Adults who gave below-median ratings to their health care were more likely to be members of a racial or ethnic minority, to have more limited economic resources, and to report fair or poor health, compared with their counterparts who gave higher ratings. Long, Sharon K., and Lea Bart. 2017. “How Patients Think about Their Health Care.” Washington, DC: Urban Institute. This QuickTake is part of a series drawing on the HRMS, a quarterly survey of the nonelderly population that is exploring the value of cutting-edge Internet-based survey methods to monitor the ACA before data from federal government surveys are available. Funding for the core HRMS is provided by the Robert Wood Johnson Foundation and the Urban Institute. Lea Bart is a research assistant and Sharon K. Long a senior fellow with the Urban Instituteâ€™s Health Policy Center.